On Thursday, May 8th 2014 at 2PM GMT, the Africa Progress Panel (APP) launched its annual Africa Progress Report during a press conference held at the Tate Museum in London, England. 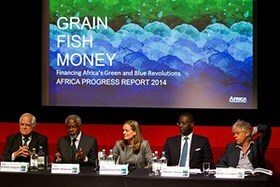 Presented to an audience made up of international media, global think tanks, NGOs and global business leaders, the 2014 Africa Progress Report Grain, Fish, Money – Financing Africa’s Green and Blue revolutions, finds that Africa can and must unleash green and blue revolutions in its agriculture and fisheries. The report highlights the opportunities for Africa, the world’s growing demand for food and the critical importance of agriculture and fisheries for two thirds of people in Africa engaged in these sectors. The report also recommends related policies, including policies to scale-up Africa’s infrastructure and extend its financial services. Kofi Annan, chairman of the Africa Progress Panel and former Secretary – General of the United Nations, hosted the press launch alongside Caroline Kende-Robb, Deputy Executive Director, Africa Progress Panel. Panel members in attendance included Peter Eigen, Founder of Transparency International, and Founding Chair and Special Representative of the Extractive Industries Transparency Initiative (EITI), Sir Bob Geldof, Musician, Businessman, Founder and Chair of Band Aid, Live Aid and live8, Co-Founder of DATA and ONE Campaign Advisor and Advocate, and Tidjane Thiam CEO, Prudential Plc.